Families are invited to enjoy an interactive day at Children’s Museum of Atlanta free of charge. Thanks to the generous support of our sponsors, we will offer extended hours and free admission to families four times a year. 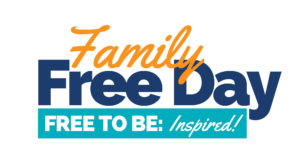 In addition to exploring the Museum’s featured exhibit, Family Free Day will also include a festival-like atmosphere celebrating innovation and creativity. Registration opens April 30 at 7 AM. Click HERE for more information.